BU is looking for summer interns! Read more about BU is looking for summer interns! 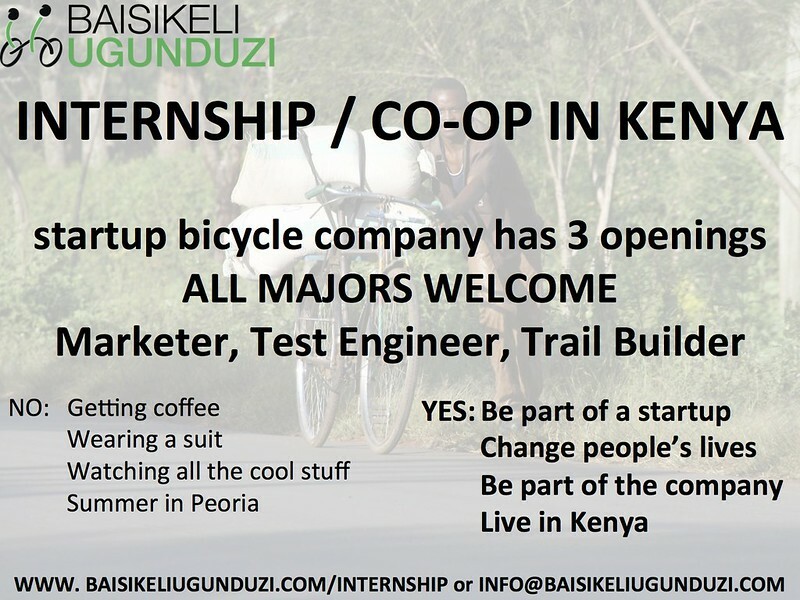 We are looking to hire a full-time Sales Manager to join the Baisikeli Ugunduzi team. Do you fit the position? Send us your resume along with a cover letter! Production has start this week from the comforts of Ben & Jackie's kitchen & living room. Let's just say that we're anxious for the factory to be finished. Read more about Production has begun! Training mechanics to correctly install Milele Tubes is vital to the succuss of BU. We are happy at mechanics's excitement to work with us and look forward to training many more in the near future. Boda Boda Sacco Launch Day set! It's official. Baisikeli Ugunduzi and the Boda Boda Sacco of Kitale are teaming up for the first day of Milele Tube sales! We're very anxious as this day has been a long time coming. We're prepared and couldn't be more excited. Read more about Boda Boda Sacco Launch Day set! Another TV interview with KBC! The local news agency, Kenya Broadcasting Agency (KBC), recently interviewed Baisikeli Ugunduzi and our test rider, Titus, in front of the new factory. Titus has been a reliable tester and excellent sales man for the milele tubes. On a typical day Titus rides nearly 100 km, buying and selling maize to other villages. Read more about Another TV interview with KBC! 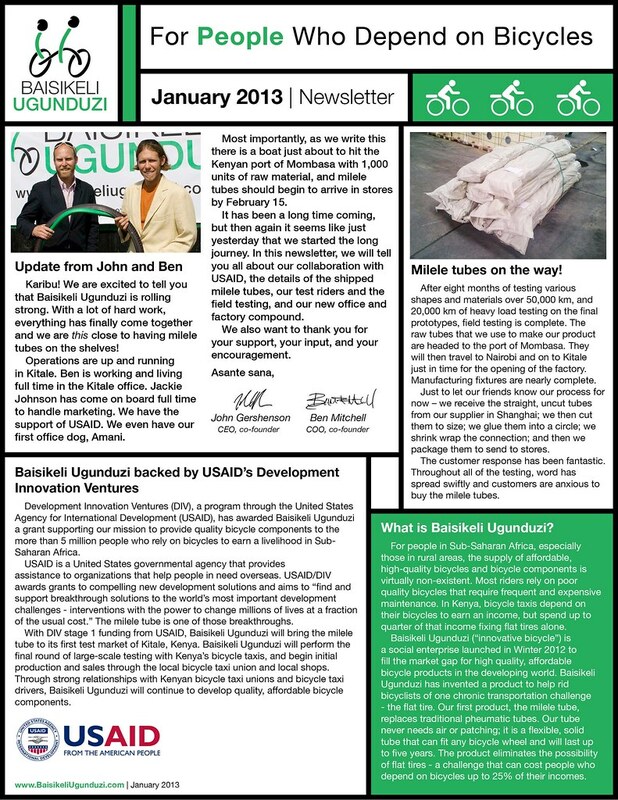 Read more about Our January 2013 Newsletter! Discussion of the milele tube on Race Blog. 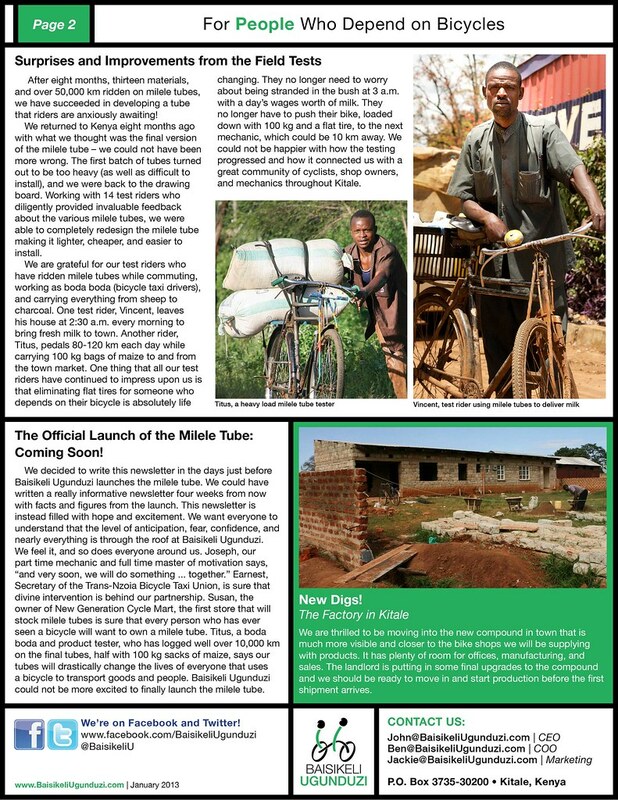 Read more about Discussion of the milele tube on Race Blog. Read more about A mention in Bike Rumor!